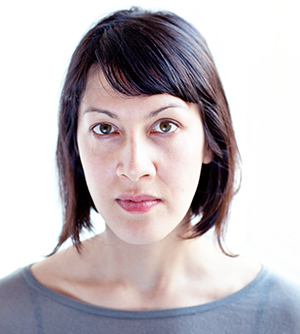 Editor’s note: In the last post of the Stories to Action edition, urban research designer Adriana Valdez Young @thepublicagency tells us how she used stories gathered from ethnographic research to design a game for architects and planners. Her “action,” a game called Arrivalocity, allowed users to access stories from her fieldwork. Although not all “actions” turn out as we expect. Adriana shares with us how she would approach this process if she were to do this again. All designers and researchers can learn from her very open and honest reflection. Adriana Valdez Young makes creative learning and research platforms that engage people with their city. She is the co-founder of English for Action in Rhode Island, helped launch KARAJ in Beruit and is the co-editor of Betta, an architecture zine on lifestyle and conflict. 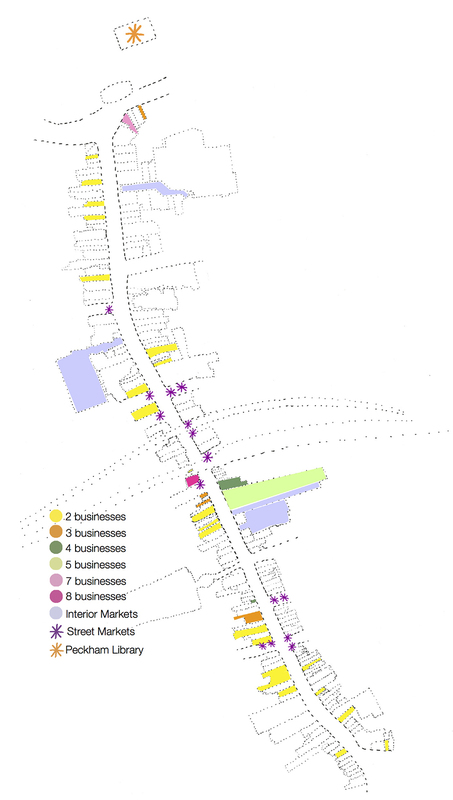 An individual storefront subdivided from 1 to 8 businesses over the course of 3 years. One day in Eindhoven for a lighting workshop. The next day, back to London for a one-hour walk down the street, followed by six hours drawing plans for a boutique hotel, art cinema, and food market to present to city officials. This is how a group of architecture firms spent two days in the spring of 2012 shaping a gentrified vision for Rye Lane (Olcayto 2012). Designers, planners and developers shape our cities, yet they can spend little to no time in the field before delving into decision making. In the context of culturally-complex and rapidly changing streets, the results can be generic and damaging characterizations, leading to bland and detrimental designs. 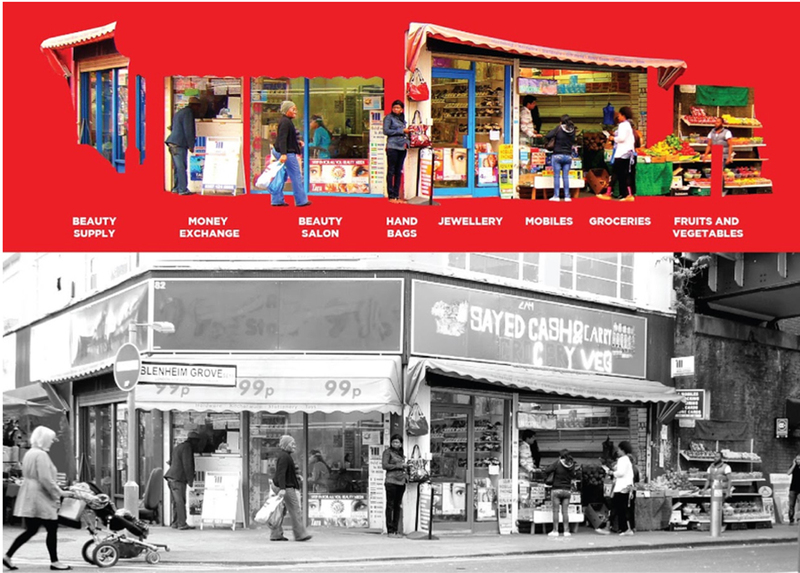 As a researcher with the ‘Ordinary Streets’ project at LSE Cities, I spent several months in 2012 learning about the culture of trade on Rye Lane – a dense, multicultural high street in the neighborhood of Peckham, South London. Rye Lane is a street where businesses and shoppers regularly out-maneuver tight spaces and budgets. It is an entrepreneurial and cultural destination, where a newly arrived immigrant can rent an outdoor market stall for a daily rate of £10 – using only a mailing address and a mobile number to secure a permit; where a woman can buy exactly the same foods she cooked, hair style she wore and movies she watched in Lagos – all in the same shop; and where a refugee from Iraq manages a store that he subdivided from one to eight micro businesses – each one run by immigrants. In this ongoing retail remix, business owners slice through glass storefronts to add service windows and street displays to sell mobile phones, DVDs and popcorn. They put up temporary walls to partition a single property into a grocery store, hair salon and eyelash bar. They make plywood and plexiglass cabins at the rear of their shops to house more intimate trades like money transfers. While these ad-hoc design interventions are common in emerging economies, they conflict with London’s official planning norms and aspirations. In the eyes of local officials and the mainstream media, Rye Lane carries a stigma as dangerous, discounted, messy and overall, as failing (The Economist 2012). 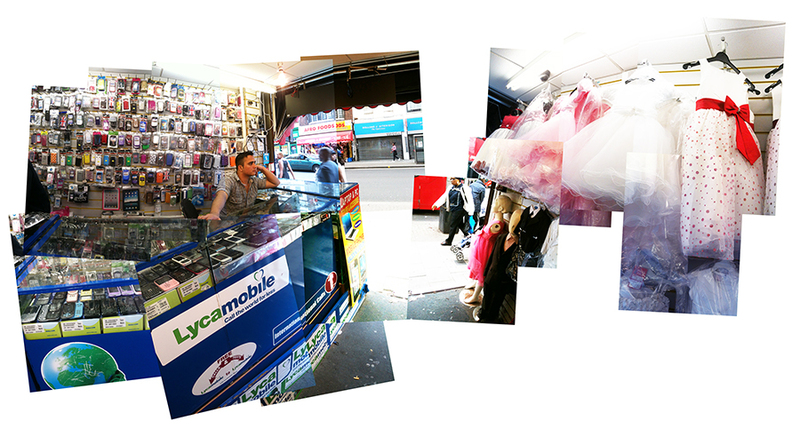 A single store hosting a mobile phone vendor and custom dressmaker – with a view out to Rye Lane. A single store hosting a mobile phone vendor, dressmaker, and a booth for money wires at the rear of the shop (not pictured). 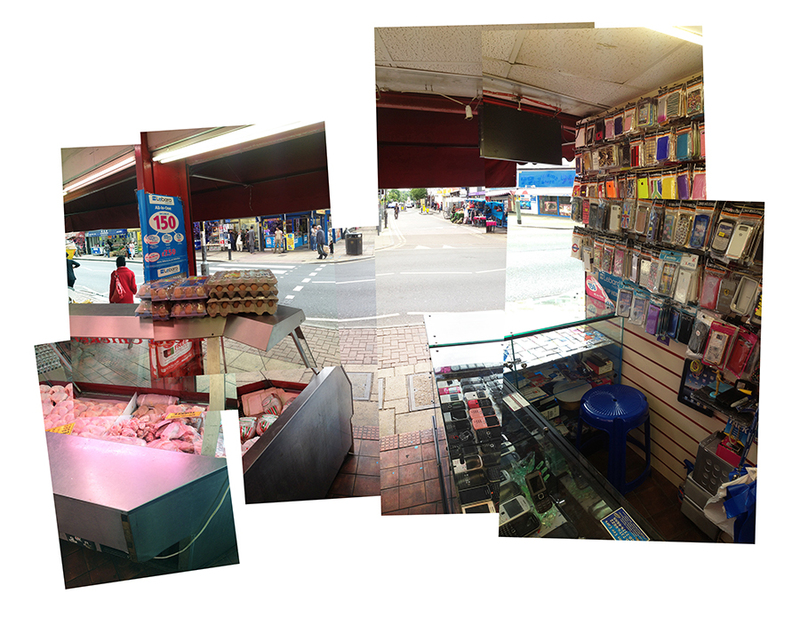 A single store hosting a mobile phone vendor, a butcher, and a grocer, sharing an open air entrance from Rye Lane. I wanted to create a way for planners, politicians and other outsiders of influence to consider Rye Lane’s street-level innovations as culturally and economically successful. I also wanted to encourage architects and planners to increase their appreciation for the design sensibilities of informal, flexible and multicultural businesses. My hope was that if planners could navigate the street through the stories of entrepreneurs and neighbors, they would support planning interventions that reinforced rather than squashed existing retail cultures. To make this happen, I decided to build a game. A few years ago, I made card games for planners in Mumbai to gather public feedback on the new master plan. Unlike written surveys or formal interviews, games invite people to escape reality, test new skills and have fun. They also help to break down social and economic barriers to participation. In particular, location-based games encourage players to explore their environment and make new connections between what they see around them and what they envision to be possible. As a street polarized by contested design visions, cultural stereotypes and illicit activities, a game seemed like a non-threatening, productive platform for both planners and the public to engage with. To create a feedback loop between researchers and participants who may not otherwise see how their contributions influence a study. To meet these goals, I designed three mobile games that invite players to take the role of a refugee starting a new business, a young mother raising a family and a planner re-designing public spaces. I built the games using the free and open source platform 7scenes, which allows you to script a Google Maps based narrative that can be freely downloaded and played on an iPhone, iPad or Android phone. Since the platform is GPS-activated, players must be on the street in order for the game to run. 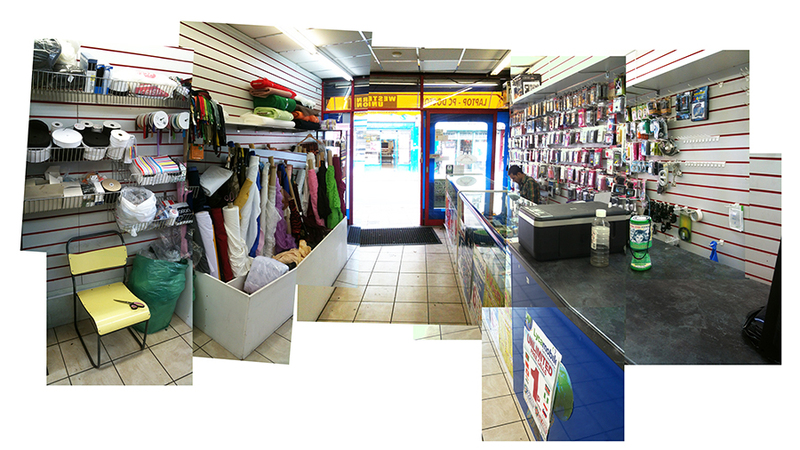 Aerial view of all 199 shops on Rye Lane, colours indicate multiple businesses per store. The first person I met on Rye Lane was Nasser, a young Afghan refugee who arrived to London in 2003 without any work experience. Advised by relatives to head to Peckham in search of a job, he first apprenticed at a local food shop before partnering with a friend to run a fruit and vegetable stand on Rye Lane. He paid £10 a day to rent a 2 x 3 meter spot in a small plaza. He had ambitions to expand to run another business from an indoor market stall. Nasser’s story shared commonalities with several other entrepreneurs I interviewed, each of whom were able to use the daily and weekly rental schemes, loose permitting requirements, and the collective culture of micro-incubation to launch their own businesses. I built the Arrivalocity game based on the stories of four small business entrepreneurs (including Nasser) whom I interviewed over the course of several months. In this game, players take on the role of a recently arrived refugee from Afghanistan and have up to one hour to find a room to rent, buy a mobile phone, learn how to send money home to their family and find a job or identify a business they want to test. At the start of the game, players are given a ‘wallet’ with a suggested budget and a map of locations they can visit in any order (view the game book). With assistance from the Refugee Council, players have a budget of £75/week to rent a room off Rye Lane, in addition to £500 in savings they can use for start-up costs for their own business. Players can visit 12 locations and complete challenges to earn points that will determine whether they are ready to start their own business or if they should apprentice first. They visit indoor markets, street vendors and stores, where they are rewarded for learning the regulations and loopholes of trade and zoning laws. The game aims to gives players a sense of the resources offered on Rye Lane that are conducive to small-scale entrepreneurship and staying connected to one’s home country. Screenshots from the Arrivalocity game as it appears on web and mobile platforms. View from Nasser’s fruit stand along Rye Lane in Peckham, South London. 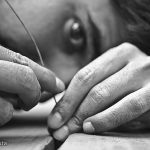 As ethnographers, we can fall prey to a ‘no detail left behind’ mentality. We get excited about all we’ve observed in the field and can over-share. For future iterations, I would scale back my own content to act as a call for participation rather than a completed story. To do this, I would engage businesses as co-designers and co-owners of the game rather than solely as content providers and approvers. 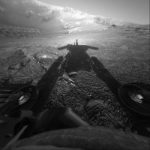 Unlike reports, journal articles and other traditional research products, the games do not have to be finished works – they can exist as mutable conduits for stories and actions. While the games were an effective tool to illustrate my own urban planning vision, more platform iterations are needed to include multiple perspectives. For example, the local planning authority currently lacks an inclusive platform to gather feedback on the planning process. Based on my initial game prototypes, I would propose developing a data gathering and sharing platform using a similar open source framework capable of receiving and media, such as videos, photos and written comments via email and SMS. Community groups, business associations and others could then curate media content to create their own games and tours of Rye Lane that illustrate their understanding of the street and vision for future developments. Rye Lane is a street saturated with mobile vendors and users. However, the project could have benefitted from more analogue corollaries for participation. In addition to the printed game books I produced, I would consider using physical props, such as a bulletin board, stickers, notecards and other materials to give participants a tangible medium to add insights and stories in both building and playing the games. For example, a poster-size map showing game locations could be displayed in a storefront. It could display the game narratives and then invite the public to add more stories to the same locations. As people add content to the physical game board, I could then add this content to the mobile version. This public installation could also help demonstrate broad participation, build momentum, and spark street-level conversation that generates another qualitative data set. I also could have integrated physical props into my initial research collection, using maps, photos and other visuals I reserved for the game design as a way of guiding interviews and soliciting feedback. Partners beget participation. In a future gaming exercise, I would build more time into my fieldwork plan to involve partners in the design and testing process from the beginning. For example, I could collaborate with a small business association, planning firm or advocacy group to enhance their existing outreach and research goals. The games could be integrated into charrettes, consultation workshops or other public engagement efforts. With stronger partnerships, invested game testers would have been built into the process from the get-go, and a more focused set of participation goals and outcomes could strengthen the game narratives. I also would like to explore using the games as an educational tool for urban planning and design students. Students could collaborate to gather stories and build pieces of the game narratives in addition to running the play tests. The game design process could be an exercise in developing qualitative research methods and participatory planning skills. For readers interested in the two rounds of fieldwork I completed to design and test the games, here are the details. For six months, I went to Rye Lane 1-3 times a week, for an average of 5-8 hours. As part of the LSE Cities group, I collaborated with three architects to survey and map the street. We began by visiting each of the 199 shops and collecting the following information from the owner or manager: country of birth, languages spoken, number of employees, number of businesses per store, number of years the business has been open, and if the store was leased or owned. We found that 1 in 4 shops hosted more than business, and that traders originated from 20 different countries and 89% spoke 2 or more languages. This initial survey created a baseline snapshot of multiculturalism and dynamic business offerings to argue for the the street’s vitality. While other team members worked on maps and drawings to visualize socioeconomic data from our survey and the census, studied nearby public and cultural institutions, and interviewed city officials, my focus was to gather qualitative insights into business practices by photographing shop interiors and selecting six businesses to observe in depth. These locations included a money shop, a realtor, a street vendor, a children’s clothing store, a women’s clothing store, and a mini-souk. There, I talked with the owners, managers and co-workers about how they set up their businesses, the financial, political and design challenges they faced, and their views on the cultural and economic prospects of the street. At each location, I made 1-2 visits to lead formal interviews and take photographs, and then returned 3-4 times to observe how businesses engaged with customers, to deliver printed copies of the photos I took, and to review information and images that I would later publish in the games. I also took note of the work-in-progress aesthetic and strategy of subdivisions. False walls, booths, kiosks and service counters were constructed with makeshift, mismatched and repurposed materials, making it apparent that stores were not unified or completed works, but rather were evolving and experimental. Design interventions to open a new business within an existing shop were as minimal as a salon chair and a sign in the window advertising the chair’s rent as £75 per week or a cardboard box with SIM cards and a phone service poster atop a freezer of fish. More permanent installations included plexiglass and sheetrock booths that had locking doors and separate electricity hook-ups to house money traders, travel agents and custom jewelers. Most of the traders I interviewed had been laid off from jobs in larger companies or unable to find work before starting or joining an independent venture on Rye Lane. Those who sub-divided their shops explained the need to diversify their business offer to appease changing customer needs, lower overhead costs, and offset slow periods regularly faced by particular trades such as travel agencies and fresh produce. Owners of micro-businesses within the larger stores enjoyed affordable and flexible rent structures, low upfront investment costs, and shared customer flows with neighboring businesses (e.g. to reach the money transfer booth at the back of one shop, customers had to walk by a mobile repair counter and a dressmaker). Beyond making good business sense, the traders and customers I interviewed viewed the subdivisions as a way to replicate the market environments of their home cities. Subdivided stores created a souk-like environment that culturally resonated with shoppers and shop owners who hailed from cities in India, Asia and the Middle East, where dense and dynamic informal markets dominate the street. On the other hand, two owners who ran high-end clothing shops since the mid 1980s told me that they intentionally avoided subdividing their shops to distinguish their image from discount retailers. They regularly declined offers from people looking to set up mini mobile shops in their storefronts, offering rents between £50 to £200 per week, because they viewed subdivisions as messy, cheap and legally precarious. Overall, while the culture of subdivisions facilitated incremental growth, entrepreneurship and low vacancy rates, I learned that these micro-businesses not only had a negative reputation with city officials, but also among their more established neighbors. Detail from the Shopomama game book. Next, I spent one month designing and testing three mobile games. In addition to Arrivalocity, here is how I translated real stories from the field into two other fictional gaming scenarios. Real Story: I spent time hanging out a Cash & Carry shop, which between 2009 and 2012 had been gradually subdivided to host eight businesses. Apart from learning how one 16-year-old from Afghanistan managed the property, I observed how many mothers came to shop at this mini-souk because of the convenience and comfort of one-stop shopping, flexible lay-away plans, the multilingual salespeople, and the welcoming attitude toward children. As city planners and local leaders were considering altering zoning laws to restrict owners from sub-leasing their stores to multiple tenants, I aimed to convey the cultural and social importance of mixed businesses for local shoppers. 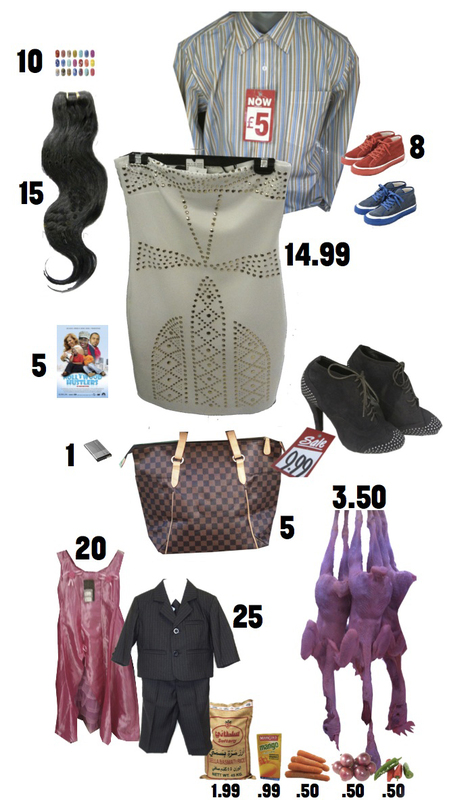 Game Scenario: As a mother of two who has recently moved to Rye Lane from Lagos, players are tasked with the weekend shopping for the family. With two kids in tow, players have up to one hour and £150 to shop for the following: ingredients to cook dinner for five, special occasion clothing for the entire family, a Nollywood DVD, and a manicure (view the game book). Along the way, players also find a place to access free WIFI and change their baby’s nappy. At the start of the game, players have a ‘wallet’ with with a suggested budget and a map of locations they can visit in any order. Players experience the social amenities, affordable prices and other conveniences that subdivided shops offer to families. Real Story: I interviewed a local council member who complained that Rye Lane was ‘untidy’ and lacked the respectable businesses found on more prosperous London high streets. This attitude was also prevalent among long-term residents and business owners, who were uncomfortable with how new immigrant populations had rapidly altered the commercial culture of the street. I wanted to create a game to counter this perception of the street as economically failing and aesthetically ‘foreign,’ and show the importance of its independent stores as a foundation for innovation and resilience in a tough economic climate. 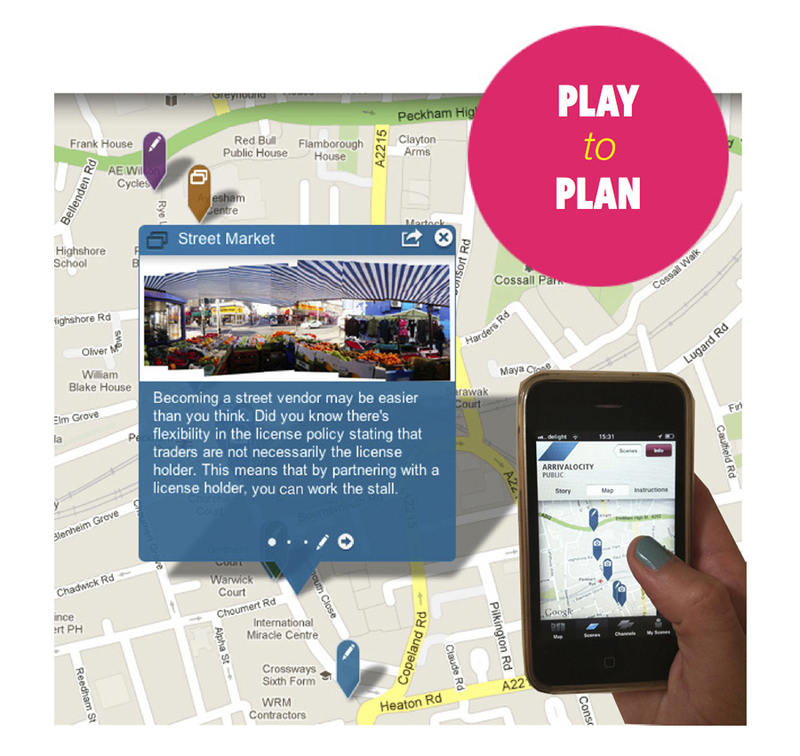 Game Scenario: Visitors to Peckham Rye Lane are invited on a walking tour of four of the city council’s real redevelopment sites, beginning at the rail station and ending at the cafe of the Rye Lane Market. The title riffs off Tech City in East London, a hub of tech-based companies that is celebrated as ‘Europe’s centre of innovation.’ Pech City guides the player to value the concentrated start-up culture driven by everyday tech needed to send money, messages and media around the world (view the game book). Along the tour, players have the opportunity to envision how the economic and mobile culture of the street could be scaled up to inform the upgrading of the four sites. Rather than prioritise historic preservation or make room for large chain stores, the tour illustrates how these commercial sites can instead host business incubators, cultural and media production facilities, and education and training programs that complement existing street trades. 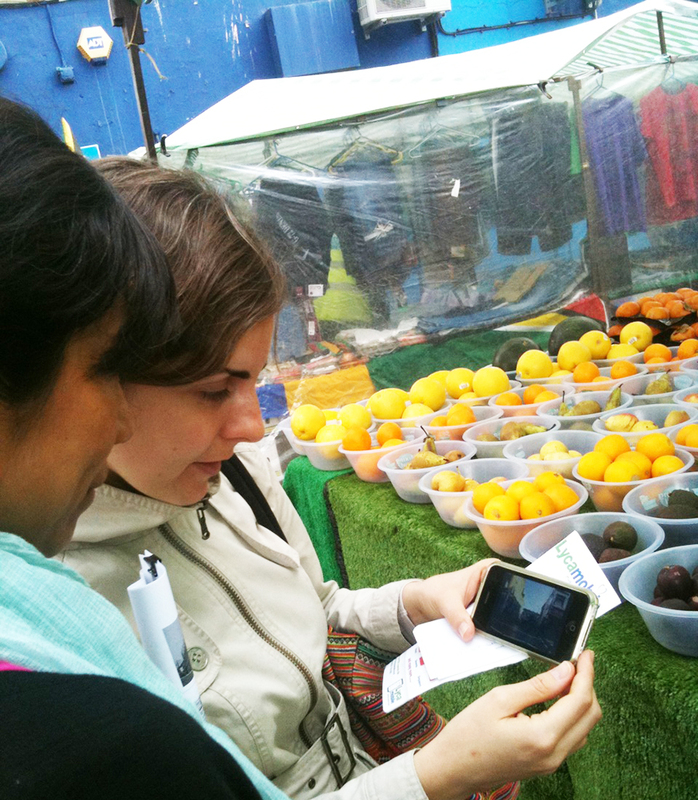 Game testers with backgrounds in social work and community advocacy visit Nasser’s fruit stand and view video content about this location as they play Arrivalocity. When it came to testing the games, I reached out to the architects and city officials involved in the original two-day charrette that had provoked my design experiment. However, none of them agreed to play the games. Although I managed to interview an architect and a journalist who participated in the charrette, they told me they did not have time to play test the games. The remaining architects (whom I had no direct personal or professional connection to) either never responded to my emails and phone calls, or replied explaining they were too busy. I received the same response from several local politicians and city planners whom I also tried engaging. Perhaps asking professionals in demanding sectors to dedicate one hour to playing a game was too absurd of a request. However, if the games were to be included as a required exercise in a city-run charrette or urban design conference, maybe then would architects, planners and politicians be compelled to play. The first reviewers of the games were the managers and owners of the six businesses I had profiled in my research. 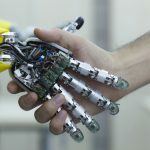 While they expressed interest in the potential of the digital platform to promote their businesses to a broader audience, but were skeptical that government officials would take the time to play them. This was an indicator of the ongoing alienation they had experienced from local political leaders and the planning process. During our interviews, they shared stories about politicians failing to consult them about future plans or to compensate them from business lost during public works improvements. In addition, I think this was also a reflection of their self-reliant attitude that had propelled them to start their own businesses and not rely on government interest or support. They suggested that the games would function better as a physical bulletin-board, where businesses could post their own ideas and images of their stores that city officials could chose to factor into the planning process. Also, in the future, I would have had an impartial colleague test the games with the business owners, as they may have felt compromised sharing negative feedback with me after we had built up close relationships during my field work. In the absence of planners and architects, I enlisted four colleagues to test the games: two community advocates from the public sector and two tech developers and designers. Only one of the tech designers lived near Rye Lane and was familiar with the area. She reviewed the game independently and then we discussed her feedback later in an in-person interview. With the other three outsiders, I accompanied them on their first visit to the street and gave them minimal instructions and prep, before they set off to play the games on their iPhones as I trailed their footsteps. The two players with backgrounds in community advocacy and social work were enthusiastic about the games as educational and grassroots organizing tools. They not only enjoyed the experience of exploring the neighborhood, getting prompts to speak with people, and learning about the culture of business practices, they also appreciated how the game placed business owners in the position of experts and players in role as learners. One player, who led a bike safety campaign in Santiago, Chile explained that the games could be the equivalent of when her organization asked planners to ride bicycles and see for themselves what dangers exist for cyclists. They both stressed the importance of games as an opportunity to take on fresh perspectives beyond one’s professional lens. As these testers played as a pair, I observed how they were more comfortable throughout the game – conferring with each other to answer challenges, navigate the map, and discuss what they observed – and overall, showed more ease in approaching business owners. This social factor of play raised the importance of applying the games to collaborative learning and design settings, in which the game could spark narrative-based ideation. The two players with tech backgrounds provided feedback on the user experience and possibilities for new platform iterations. One tester suggested the process could be much more efficient. Rather than play the game, community advocates could apply the game content in presentations to planners, city officials and other city makers. He did not see value in the game as an essential conduit for planners to gather the information themselves, but instead saw potential in the game as a strategy to more effectively crowdsource information to influence the planning process. The other tech tester who was more familiar with Rye Lane, suggested the game be used a design probe in a participatory workshop to envision the future of the street. She framed the game as a potential platform for businesses to add and discuss their ideas, and stressed the need for a physical corollary, such as a bulletin board at a central public space, where people could add ideas via the mobile platform and also in person. She also emphasized the importance of making the game a people’s project, and designing more opportunities for businesses and residents to appropriate the platform for their own purposes. Brilliant, evocative and useful. I love it.